A San Antonio shootaround practice is winding down in silence, except for the occasional sound of a dribble or the whooshing noise that accompanies the ball going through the net. Players are lined up along the sides of the foul lane, watching teammates take two free throws before moving on in orderly fashion. It’s very orderly, no half-court shooting contests or wasting energy. And it’s a microcosm of how the Spurs do business — simply and effectively. "You try to do things that are logical," Spurs coach Gregg Popovich said. "It’s sort of what works for us." In a league that isn’t shy about showing off glitz and glamour, the Spurs just show up, do their job and usually go home with the win. And the team wearing San Antonio’s silver and black this season perhaps is the franchise’s best yet under Popovich, no small statement considering that he’s already won five NBA championships with the Spurs. At 45-8 so far, there’s no doubt that this year’s team is good enough to give him hope of winning ring No. 6. "All the guys love him," said Spurs All-Star forward LaMarcus Aldridge, the prize of last summer’s free-agent class. "They understand that he thinks differently, outside the box. And they understand that he’s very strict. But he’s a winner, and they love him." Around the league, there’s no coach who commands the respect — from players and coaches — than Popovich, who can speak eloquently on any number of topics but almost steadfastly refuses to reveal the secrets of his basketball success. Maybe that’s part of his genius. Or maybe, as Spurs forward David West suggests, there are no secrets to share after all. When West first joined the Spurs over the summer as a free agent, his initial order of business was to find that mystical something that obviously exists and separates Popovich from other coaches. His quest turned up nothing. "There’s no big mystery or anything like that," West said. "It’s just the way that they do things. Find a formula that works, and stick with it." Such is what Popovich has done for two decades and counting in San Antonio, where the Spurs are quietly putting together a most historic season. They’re on pace for the third-best regular season record in NBA history — but as of now that would only merit the No. 2 seed in the Western Conference because of defending champion Golden State’s dazzling 48-4 start. Popovich is great at winning, and one of Cleveland star LeBron James’ favorite memories is how on a night in 2013 when Popovich was equally good at losing. 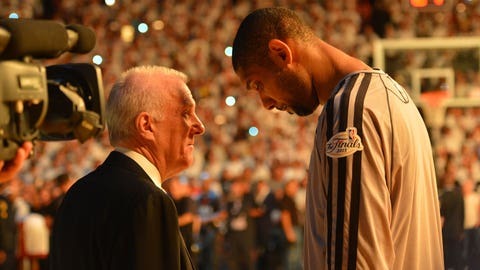 The Spurs lost to James and the Miami Heat in Game 7 of the NBA Finals that season, and Popovich remained on the floor for a few minutes to congratulate the newly crowned champions. "There’s just so much respect," James said. "Myself and Pop will always have a connection. I’ve faced them three times in The Finals. I’ve admired what he’s been able to do with that franchise for so long, the constant staples of their franchise being Tim Duncan and himself. So it’s always been a great treat to kind of watch him from afar." At the All-Star Game, players watched Popovich up close in his role as Western Conference coach. He was playful — "be a leader," he yelled at reigning NBA MVP Stephen Curry of Golden State in one drill — and reflective, clearly enjoying spending time with the players that he’ll spend the rest of the season trying to beat. He even tried guarding Kobe Bryant 1-on-1, with a predictable outcome. "That was awesome," Bryant said. The Spurs go to the playoffs for the 19th consecutive year, win at least 50 games for the 17th straight year (the last time they didn’t win 50 the league only played a 50-game schedule), and are 28-0 at home. And here’s one of the things that make them different: They legitimately love being overshadowed by the Warriors. Around the league, for as great as the Warriors are, it’s doubtful many would count the Spurs out. "They have such a respected program that they’ve built over 20 years," Heat coach Erik Spoelstra said. "The mainstays are there, Coach Pop … and the philosophy always remains the same. In this league or in all of pro sports, the toughest thing is consistency and ultimately greatness is consistency. They’re a model of that."